In the Annual Return GSTR 9, as we all know, details of outward and inward supplies along with ITC claimed, reversed, tax liability, tax payment and the adjustments are to be reported. In my previous article, I have covered Outward Supplies in GSTR 9, most of which can be auto-populated using GSTR 1, 3B and other returns filed with the Government. However, in case of inward supplies and ITC details, only some of the details can be derived from the data available at GST system. 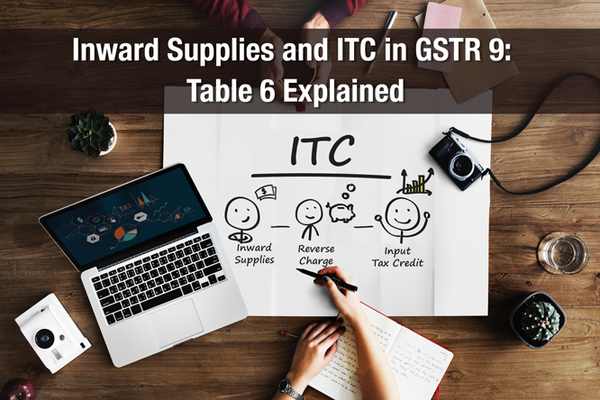 The tables 6 and 7 consist of ITC related details which are filed during the FY 2017-18, while table 8 includes details which are filed upto Sept 2018. Let us deep dive into the information related to ITC that is needed to be provided in Table 6 of GSTR 9. Please read my next article for Analysis of Table 7 of GSTR 9. There are 15 sub-points in Table 6 and most of the details come from GSTR 3B. In GSTR 3B, table 4 consists of ITC information and is summarised below for quick reference. Table 6A: Total amount of input tax credit availed through FORM GSTR-3B. Table 6A is ideally the sum total of Table 4A of FORM GSTR-3B. Table 6A of GSTR 9 contains the details of ITC availed in GSTR 3B during the financial year. The purpose of this clause is to aggregate the quantum of Input tax credit availed by the Registered Person on import of goods, import of services, Inward Supplies liable to reverse charge, Tax credit received from the Input service distributors and any other ITC availed on regular inward supplies. ITC availed in GSTR 3B for the period July 2017 to March 2018 only has to be disclosed in this Table. ITC relating to 2017-18 availed in subsequent GSTR 3B should not be disclosed in this Table. Such data would be disclosed in Table 8C of GSTR 9. The tables 6C and 6D consist of the details to be provided on the transactions which are impacted by reverse charge. In 6C and 6D, the ITC claimed details are to be further categorised into input, capital and services. Aggregate value of input tax credit availed on all inward supplies received from unregistered persons and registered person (other than import of services) on which tax is payable on reverse charge basis shall be declared in Table 6C and Table 6D. Table 4(A)(3) of FORM GSTR-3B may be used for filling up these details. Data disclosed in Table 6C and 6D should not exceed the data disclosed in Table 4G of GSTR 9. GST paid on inward supplies liable to reverse charge which is not available as credit, should not be disclosed in this Table. If Goods supply by SEZ On cover of a bill of entry than DTA Units show this transaction in Table 6E. If Goods supply by SEZ without the cover of a bill of entry than no need to show transaction in this table. It will be treated as a normal transaction. Table 4(A)(1) of FORM GSTR-3B may be used for filling up these details. Only the IGST paid on import of goods can be availed as ITC. BCD and Social Welfare Surcharge cannot be availed as ITC. Ensure that the GSTIN is updated in the ICEGATE and the GSTIN appears on the Bill of Entry. Data for this clause can be confirmed with the details in disclosed Notes to Accounts to Financial Statements. The rate of exchange for determining the value of taxable service should be the rate of exchange as determined as per generally accepted accounting principles as on the date of time of supply as per section 13 of CGST Act. The Registered Person should be in possession of invoice issued by ISD u/r 54(1) of CGST Rules. It should be noted that the ineligible portion of ITC distributed should not be availed as ITC. Registered Person should report all input tax credit claimed, reversed and reclaimed by him during the period July 2017 to March 2018. ITC disclosed in Table 6B and 6H should be equal to the data disclosed in Table 4A (5) of GSTR 3B. ITC which has been availed and reversed during 2017-18 and reclaimed in 2018-19 should not be disclosed in this Table. Table 6 I :This contains the aggregate of ITC availed on inward supplies including services received from SEZ, inward supplies received from unregistered person liable to reverse charge, inward supplies received from registered person liable to reverse charge, import of goods, import of service and ITC received from ISD. Table 6 J : Ideally, the difference in Table 6J should be nil. This is for the reason that the amount disclosed in 6A is auto populated from GSTR 3B of July 2017 to March 2018. Further, the amount disclosed in Table 6B to 6H is merely the classification of ITC availed in GSTR 3B. In these tables, the details related to transitional credit and other input tax credit availed, needs to be reported. Table 6K: Here the Registered Person should report the amount of credit received in the electronic credit ledger through FORM GST TRAN-I upto 31st March 2018.In respect of Registered Persons who were not to file the Transition returns due to IT related glitches, the Government vide Circular No. 39/13/2018-GST dated Apr 3, 2018 has specifically allowed such taxpayers to file the returns till Jan 31, 2019 (Order No. 4/2018-GST dated 17.09.2018). In respect of such persons, no data would be disclosed in Sl. No. 6K of GSTR 9. Table 6L:The Registered Person should disclose the quantum of ITC received in the electronic credit ledger through FORM GST TRAN-II. Where the Registered Person has filed TRAN-II after March 2018, the amount of such credit should not be disclosed in Sl. No. 6L of GSTR 9. This is for the reason that the credit through TRAN-II would have been credited to electronic credit ledger in the month in which TRAN-II was filed. Table 6M:Credit availed under section 18(1)(a) to 18(1)(d) of the CGST Act, 2017 it to be disclosed. Credit availed under section 18(3) read with Rule 41(1) of CGST Rules, 2017 on account of sale, merger, demerger, amalgamation, lease or transfer of a business is to be disclosed. In 6M, the Registered Person should disclose the quantum of ITC received in the electronic credit ledger through FORM GST ITC-01 and FORM GST ITC-02, the amount of ITC should not be disclosed in 6L of GSTR 9. These sections are the grand totals for the details provided above. Table 6O : Total ITC availed as per GSTR-3B and other ITC credited directly to electronic credit ledger by filing TRAN-I, TRAN-II, ITC-01 and ITC-02. To summarise, Table 6 covers all details of ITC availed during the financial year and needs to tally with the details filed in GSTR 3B. Read our article on the analysis of Table 7 and 8 which are also related to ITC transactions.